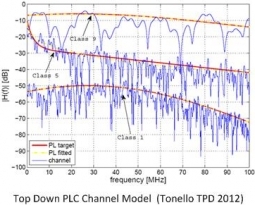 Bottom-up channel modeling refers to an approach where the channel impulse/frequency response is obtained via the application of transmission line (TL) theory to a specified network topology, cables and loads characteristics. Conventionally, this approach is applied to obtain a specific response and it is also referred to as deterministic model. Further, for complex networks the existing calculation methods are rather complex. We have extended this idea in order to obtain an accurate statistical channel generator. 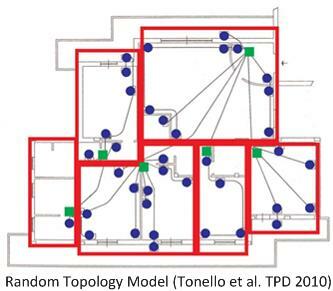 This has been obtained by developing a realistic statistical description of in-home topologies. To overcome the computational effort in obtaing the channel responses, we have devised an efficient method for the computation of the channel transfer function. can be used in a CAD mode, i.e., from the topology layout it calculates the channel response. [R7] A. M. Tonello, F. Versolatto, “Bottom-Up Statistical PLC Channel Modeling – Part II: Inferring the Statistics,” IEEE Trans. on Power Delivery, 2010. [R8] F. Versolatto, A. M. Tonello, “An MTL Theory Approach for the Simulation of MIMO Power Line Communication Channels,” IEEE Trans. on Power Delivery, 2011. [R9] A.M. Tonello, F. Versolatto, “New Results on Top-down and Bottom-up Statistical PLC Channel Modeling,” Proc. of Third Workshop on Power Line Communications (WSPLC 09), Udine, Italy, October 1-2, 2009. [R10] F. Versolatto, A. M. Tonello, “Analysis of the PLC Channel Statistics Using a Bottom-Up Random Simulator,” Proc. of IEEE ISPLC 2010, Rio De Janeiro, Brazil, March 28-31, 2010. ISPLC best student paper award. 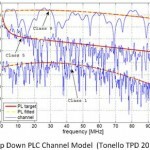 [R11] F. Versolatto, A. M. Tonello, “A MIMO PLC Random Channel Generator and Capacity Analysis,” Proc. ISPLC 2011, Udine, Italy, April 3-6, 2011. [R12] S. D’Alessandro, A. M. Tonello, “On Rate Improvements and Power Saving with Opportunistic Relaying in Home Power Line Networks,” EURASIP Journal on Advances in Signal Processing, 2012. Enhanched emulation tools are provided by WiTiKee.